Team Futaba’s Kurt Koelling, 2013 Scale Aerobatics National Champion! 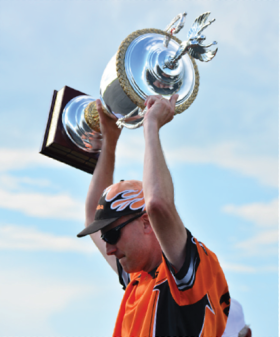 Home » New Release » Team Futaba’s Kurt Koelling, 2013 Scale Aerobatics National Champion! July 1, 2013 – Team Futaba’s Kurt Koelling used his 18MZ to win almost every round in the Unlimited class at the 2013 Scale Aerobatics National Championships, held June 25-28 in Muncie, Indiana. Kurt’s extremely precise flying style has taken him to the top spot in many Scale Aerobatic competitions. He uses the power of the 18MZ to precisely set up each of his airplanes, giving him an additional edge over the competition. Kurt also won the coveted Bennett Cup, which is presented to the competitor with the best overall scores throughout the entire competition. The cup’s namesake, William G. Bennett, was the famed owner of Circus Circus and other famous properties in Las Vegas. Mr. Bennett and Circus Circus were also known for sponsoring events. One of these was the legendary Tournament of Champions (TOC). The Scale Aerobatics National Championships are held annually at the Academy of Model Aeronautics, International Aeromodeling Center in Muncie, Indiana. All aircraft flown must be modeled after full-size aerobatic aircraft. Fourdifferent skill level classes are offered, with Unlimited being the top class. Hobbico and Futaba would like to congratulate the other members of Team Futaba that also competed in the Scale Aerobatics National Championships: Curtis Cozier, 4th Advanced, Will Berninger, 3rd unlimited, Ty Lyman, 4th Unlimited and Frank Noll, Unlimited.